A giant outdoor landmark sculpture by Damien Hirst, a celebration of Mary Fedden, sculptures and drawings by Elisabeth Frink, Japanese-inspired paintings from Lisa Milroy, and in a double-bill: new work from Jack Vettriano and black and white photographs from Jeannette Jones, feature in the 2011 summer programme of Royal West of England Academy, Bristol. Not since the infamous Bristol graffiti exhibition ‘Crimes of Passion’ in 2009 and the major architectural dome extension of 1914 has the RWA had such an eye-turning addition to the front of the building. 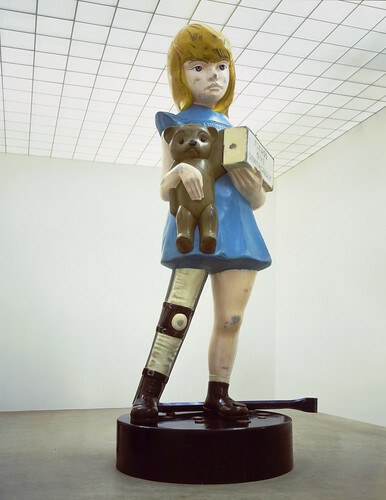 For a year from 6 June 2011, Charity – Damien Hirst’s twenty-two foot high painted bronze statue based on the 1970s Spastic Society’s charity box – will stand on the RWA’s forecourt as a monumental and epic comment on social injustice. Celebration (6 –26 June & 3 July – 31 August 2011) draws on a lifetime of work from the 1950s to the present day, from one of Britain’s best-loved artists and former RWA president, Mary Fedden. Assembled from public and private collections, the show celebrates Fedden’s favourite motifs: still life, flowers, animals and landscape. Lisa Milroy made her first paintings of Japanese prints in 1986 and throughout her career, Milroy’s experience of Japan has acted as a constant source of inspiration. For her exhibition Improvisations (6 June 2011 – 31 August 2011), she brings together two groups of paintings that pay homage to Ukiyo-e woodblock prints – transcriptions of Ukiyo-e prints and, stemming from these transcriptions, the Geisha series. During the exhibition, the RWA will be making a collection for the Red Cross Japan Tsunami Appeal. 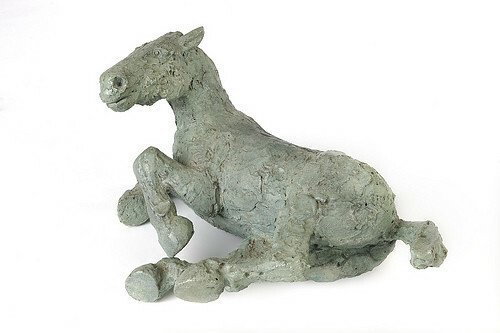 Wild (6 June 2011 – 31 August 2011) explores the central themes of one of twentieth century Britain’s foremost female sculptors, Elisabeth Frink: what it means to be wild or feral. The artworks are drawn from the Frink Archive: a unique collection from the former studio and home of the artist. As well as sculptures and drawings of birds, animals and humans, the exhibition will include the recently rediscovered sculpture, Birdman. The Ballroom Spy (28 June – 31 August 2011) is a dramatic dance-inspired collaborative show, featuring twelve new paintings by arguably the country’s most popular living artist, Jack Vettriano, and over forty black and white photographs by Jeanette Jones. The Ballroom Spy showcases the glamorous and intoxicating world of professional ballroom dancing, taking the viewer on stage and behind the scenes; from covert glimpses of backstage nerves to the full flourish bravado of performance under the glare of the spotlight.